Renal impairment or nephrotic syndrome is often a presenting feature. Approximately two-thirds of patients have an underlying lymphoplasmacytic proliferative disorder, such as multiple myeloma. An abnormal κ/λ sFLC ratio is present in around 90% of patients at diagnosis. sFLCs are useful for monitoring disease, and are recommended in International Myeloma Working Group guidelines. Figure 29.1. Immunofluorescence micrographs of a representative case of κ type light chain deposition disease. There is diffuse linear staining of tubular basement membranes (A) and glomerular basement membranes (C)for κ light chains. 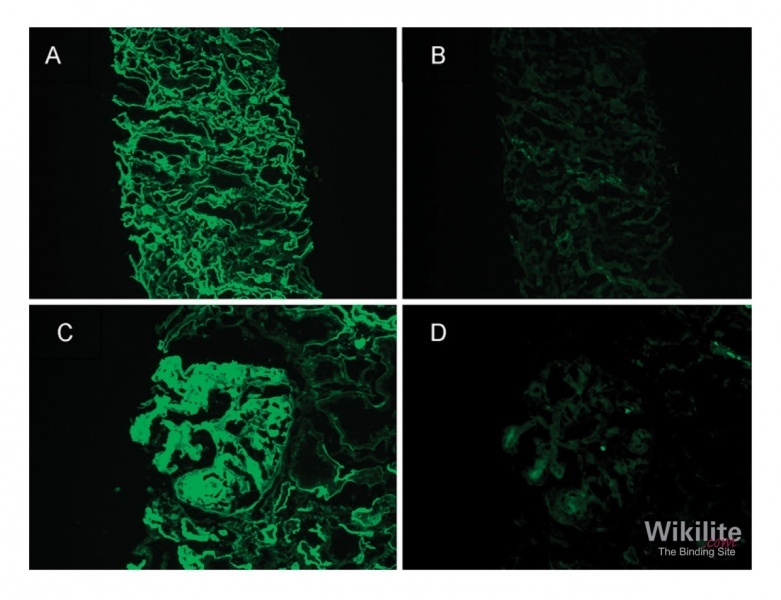 Staining for λ light chains is negative along tubular (B) and glomerular (D) basement membranes. Magnification: x200 in A and B; x400 in C and D. (Republished with permission of Clinical Journal of the American Society of Nephrology , permission conveyed through Copyright Clearance Center, Inc.). The rare monoclonal immunoglobulin deposition diseases (MIDD) comprise light chain deposition disease (LCDD), light- and heavy-chain deposition disease (LHCDD) and heavy-chain deposition disease (HCDD) . In LCDD, which comprises 80% of the cases of MIDD , monoclonal serum free light chains (sFLCs) are precipitated on basement membranes in the kidneys and less frequently, the heart, liver and other organs. Deposits can be visualised by staining of biopsy samples (Figure 29.1). As with AL amyloidosis, the disease is progressive and leads to failure of the affected organs and has a poor prognosis . However, LCDD differs from AL amyloidosis in a number of ways: 1) it is more frequent in younger women (aged 30 - 50 years); 2) renal failure is a common presenting feature; 3) the predominant light chain type is κ (typically Vκ1 and Vκ4), rather than λ; and 4) light chain deposits do not contain serum amyloid P component (SAP, a protein that typically localises in areas of amyloid) and are congo red negative. Approximately two-thirds of patients with LCDD have an underlying lymphoplasmacytic proliferative disorder: A study by Pozzi et al. reported that out of 63 patients with LCDD, MM was diagnosed in 65% of cases, whilst chronic lymphocytic leukaemia was present in a further 3% of cases. The remaining 32% of patients did not have any detectable haematological disease. Whilst monoclonal proteins are detectable by serum or urine immunofixation electrophoresis in the majority of patients (76 or 90% of cases, respectively) , the concentrations may be low  and difficult to monitor.